Thanks to its sumptuous scent, lavender is a common ingredient in everything from beauty products to bouquets. Essential oil is extracted from the flowers of the plant and used in a variety of medicinal and skincare treatments. Apart from its stress-fighting fragrance, lavender oil is commonly used to treat skin ailments, including wounds, eczema and acne. 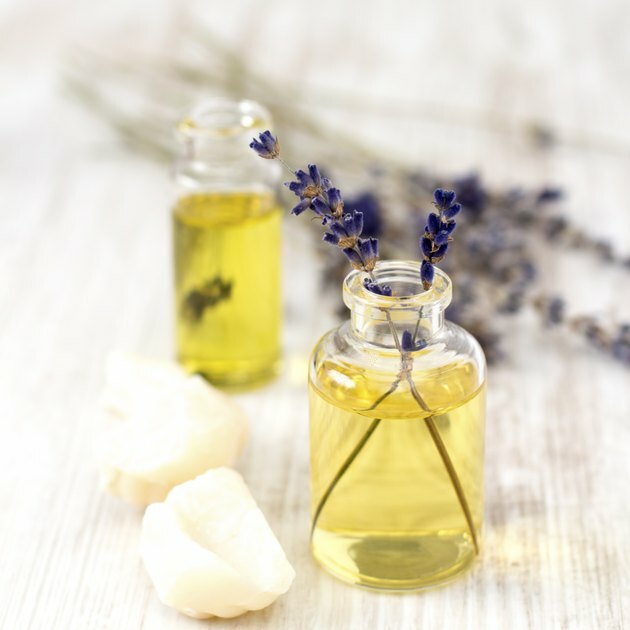 For this reason, pure lavender oil or products containing it can help fade scars, but cannot completely replace medical procedures or prescriptions. Lavender oil is a key ingredient in products that reduce the appearance of acne scars, such as Bio-Oil for face and body, recommended by "Allure" magazine. It can also be used on its own, since it's one of the few essential oils that can be used undiluted on small areas of the skin. Apply a few drops to the scarred area two to three times per day either directly onto the skin or with a saturated cloth. Be sure to rub the pure oil in gently to avoid irritation. Lavender oil can also potentially help prevent scars from forming and is commonly used in caring for wounds. Because this oil is so gentle, it can be applied directly to cuts and minor burns, minimizing the risk of them leaving long-term marks. University of Minnesota: Taking Charge of Your Health and Well-Being -- How Do I Choose and Use Essential Oils?